Carnival's party in Rome, all details and info to the good carnival in Rome. Written by alessandro on January 25, 2018 . Posted in All Stories, Curiosity, Itinerary. “After Christmas, it’s always Carnival”, it’s said in Italy, don’t you agree? This year Carnival comes late, it’s not at the beginning of February like last year in 2013. This year Carnival is on March 2nd, but obviously the events don’t occur all on one day. Lets’ take a look together and see where and how many events there will be in the Capital. Fat Thursday this year, falls on February 27th, Fat Tuesday is March 4th and we can’t wait to embrace you and have you spend the most crazy month of the year in our company. Events, parties. markets and colorful and masked displays in these days, beginning at the end of February and the beginning of March, will have you running to dance in the streets of Rome. But more than these masks, which events are actually found in the city of Rome? Let’s take a look at them together. On the dates indicated above, you won’t find a single person on Via del Corso, at Piazza del Popolo, at the Spanish Steps and at Piazza Navona, without a mask , we are certain of this. Open air theater, strange characters , Harlequin , Comedy dell’arte masks will make you feel like having fun, among the shooting stars and confetti. Not just kids have a good time , but also the adults, those’who love to masquerade, but also those who prefer to not wear masks but enjoy themselves amongst the noisemakers and the colored hats. 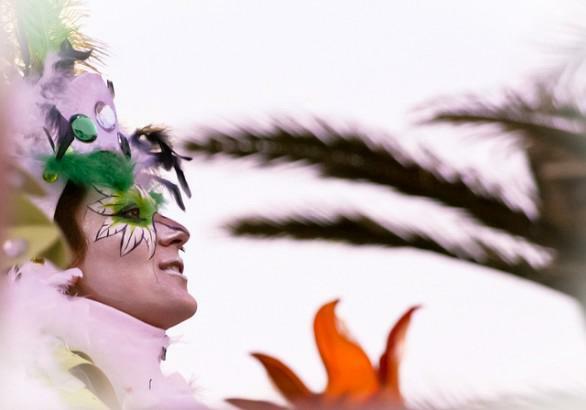 On March 4th 2014, you can’t miss the historic masked fashion parade of Via Tiburtina. The largest parade, more than 1 kilometer long, with many floats and masked groups, in a large show with antique and new Roman masks, those of Tiburtello, the beautiful Romanina, Rugantino, Dr.. Long Legs and many others. A curiosity: Rugantino, which mask is that? The Rugantino is the typical mask of the city of Rome, the man of the people, violent but with a big heart, who always ends up on the side against the law and against power. In Rome, on Via del Corso, performances of the Commedia dell’arte are celebrated, the masked parades, the celebration of the moccoletti, and the famous run of the berberi horses. Every year in Rome, Carnival is celebrated on Via del Corso, a main street in the historic center of Rome, found between Piazza Venezia and Piazza Del Popolo. 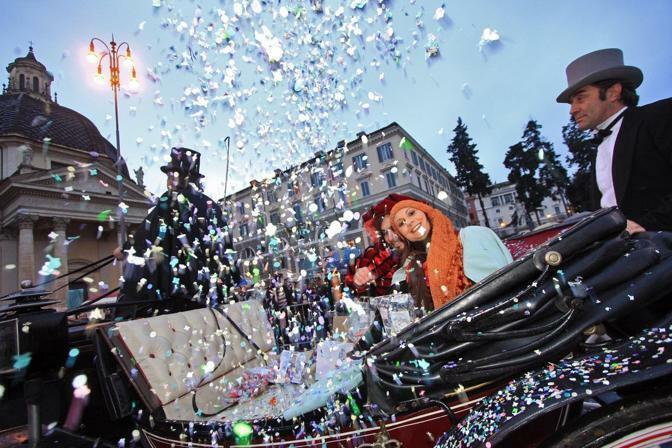 A true city prize, a horse ride, that is representative of the most important events of the Roman Carnival. Promoted by Pope Paul II , then abolished by King Emanuele II in 1874, caused by the death of a young spectator, crushed during a horse race.